Growing plants using 150 ppm nitrogen produced longer lasting plants after harvest than those grown using 200-300 ppm but cutting off fertilization prior to harvest had no additional benefit. Member of the Caryophyllaceae (pink family). Native from Southern Europe to India. Related species include baby’s breath, lychnis, silene, sweet William. Flowers are up to 3 inches in diameter. Most are double forms with many ruffled petals. Some cultivars have fragrant flowers with a clove-like scent. Plants must be disbudded during development to produce a single large flower on each stem. The name carnation is from the Latin “carnis” meaning flesh, alluding to the pale pink color of the flower. 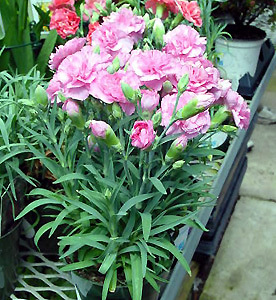 In Greek “dianthus” means the flower of Jove. Carnations are said to have sprung up from the tears of Mary as she made her way to Calvary. The pink carnation became the symbol of mother-love and of Mother’s Day, created in 1907 in Philadelphia. Will generally do well in light levels at least bright enough to read a newspaper in comfort. The scientific name is from the Greek “dios” (divine) and “anthos” (flower). Ingestion may cause minor illness. Frequent handling may cause dermatitis. While genetic engineering claims all of the headlines, Onozaki et al. (2001) showed that time-tested plant breeding activities resulted in less ethylene sensitive cultivars that have about twice the vaselife of traditional ones. Schade et al. (2001) found that flower fragrance levels were higher when flowers died naturally compared to those that died prematurely due to ethylene.